Awarded Aspire Magazine's "Hidden Gem of Dorset 2016", Nestleton is a beautiful 3 double bedroom (plus travel cot) maisonette occupying the top two floors of a Victorian house, with sea views, balcony, open fire and courtyard garden. The sun streams onto the balcony and front of the house in the morning, perfect for an al fresco breakfast, and streams into the back of the property in the evening. The maisonette has its own entrance and is accessed via a side staircase. 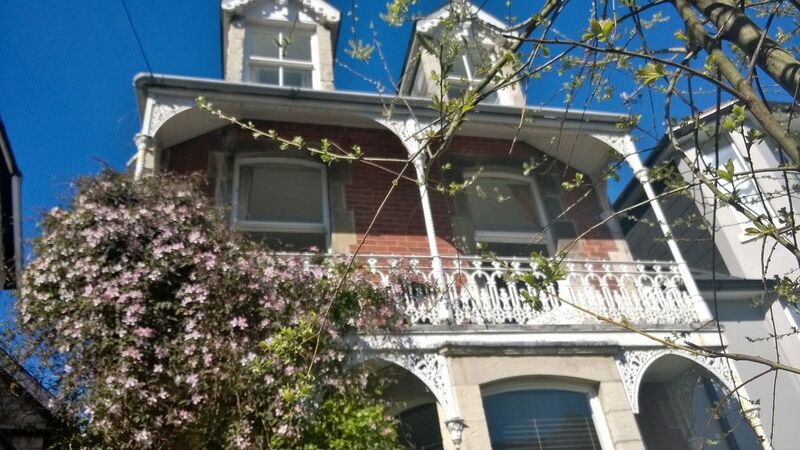 Great care and attention has been given to furnishing the maisonette in a beautiful romantic French style and it is only a 5 minute stroll into Swanage town with its many cafes and restaurants, restored Victorian pier, steam railway and long sandy beach - great for children. It is also a great place for water-sport lovers, and has a scuba diving school by the pier. Durlston country park and castle is only a 15 minute walk away and the property location will therefore also suit walkers who wish to explore the Jurassic coastline and this area of outstanding natural beauty. Corfe Castle, Studland Bay, Poole Harbour, Brownsea Island and Blue Pool to name just a few, are all in close proximity to Swanage. Children and pets are very welcome! Please note my property is strictly non smoking. Living and working in London has its benefits, but we have enjoyed nothing more than escaping to Dorset for weekends and holidays for the last 25 years. As keen camper vaners we have spent many weeks travelling around the Purbeck area enjoying its amazing natural beauty.We have become qualified scuba divers at Swanage diving school, water ski, surf, horse ride on the beach, and have a boat kept at Shell Bay Marina. The children have been brought up enjoying the sea air, boating around the Islands, visiting Brownsea Island and having mud fights! Dorset never loses its charm and as soon as we approach the chain ferry we are filled with excitement and a sense of peace. There is nothing better than then sitting on the beach watching the sun set over Brownsea Island-bliss!. When our camper van finally came to its last days (and the emission zone was introduced in London) sadly it was crushed! So we decided it was time to buy a place. Unbelievably this maisonette was for sale-unbelieveably because I have been walking past this house for 15 years saying "I'm going to live there one day" I still have to pinch myself that it's true. Unfortunately the apartment was in a neglected state-So Brian being a builder & my hobby being interior design we set about restoring it. It has been a task but we are just about there. We never tire of this wonderful part of England and are amazed that we still find new areas to explore-It well deserves the title of area of outstanding natural beauty.When boating around the Islands in Poole Harbour, you really could be in Greece! Locally nicknamed the 'Dolls House' due to its unique, pretty architecture and balcony, Nestleton is often photographed by passersby, especially when the clematis is in glorious full pastel pink bloom. The maisonette is so conveniently placed to stroll into town, laze, play or enjoy water sports on the beach, or to walk to Ballard Downs and Durlston Country Park, with its castle, cafe and panoramic views. If you're lucky you may even spot a dolphin there! Whatever time of the year, there is always something to do and see in Swanage and the surrounding area. The changing seasons emphasise the natural beauty of this area. We love waking up in the morning to the sea view, and on a clear sunny day looking across to the Isle of Wight, followed by breakfast on the balcony. We hope you love it as much as we do! All linen provided for up to 6 people plus cot. If you wish to have additional linen this can be provided at an additional laundry cost. Range cooker with electric ovens and gas hobs, large smeg fridge freezer, dishwasher, washer/dryer, microwave, double toaster, kettle, cafetiere, table, stools, fully equipped with plenty of plates, cups, utensil, baking etc. Notes on accommodation: Sleeps baby in travel cot. A cot bed which sleeps a child up to 4 years is also available with bedding, however for health and safety reasons guests will need to assemble themselves. The cot-bed fits in the master bedroom only Outside: There is a balcony with table, 3 chairs, and side views over the town to the sea. It is bathed in sun in the morning. Cleaning / Towels / Linen All linen and towels are provided (excl. beach towels, and towels/blankets for dogs/pets) for up to 6 guests plus a baby. If you would like further linen or towels these can be provided at an additional charge). Cleaning, including change of towels and bed linen, on arrival and weekly thereafter. Initial toiletries and provisions supplied such as toilet rolls, laundry powder, dishwasher tablets, soap etc. No off street parking, but free street parking in road and surrounding roads. Hi Sally, Many thanks for writing a review, I am glad you liked Nestleton and Swanage. Regarding the TV, unfortunately Swanage has some electrical surges and power cuts in March and this meant the TV needed to be retuned to get BBC. All working again now! We loved our stay at Nestleton, it is beautifully decorated and feels very warm, welcoming and homely. It had everything we needed and we appreciated having a few essentials being provided. Great location for a short stroll into Swanage and lots of great coastal walks. Would highly recommend. Lovely home with fun taste in decor! interesting quirky property in great location. This was a nice property that appealed to us. Its quite old but had been decorated in a shabby chic way which my wife enjoys. Its very close to the town, beach and a park which is great if like us you have a dog. Although the road is very steep so anyone with walking difficulties may find it unsuitable. The sea view is only possible really from the master bedroom and its more a case of you can see rather that sit and enjoy the view. The owners have gone to great lengths to make things comfortable and on our Christmas stay had left some wonderful gifts and touches to make our stay more enjoyable.There is no off road parking and the street is very busy parking wise, but we did not use the car for four days as there was plenty to do in walking distance. There is no garden for a dog so you need to nip up a steep hill which takes 5 mins when taking them for there needs, but its a nice park and everyone is very chatty. there is a small seating area outside. The place has a nice sized kitchen with all the basics for cooking however if you have a favorite pan or knives you may be best to take with you. A range cooker lets you spread your wings if that's your thing, it is ours. Thank you for taking the time to write a review Brian, it is very much appreciated. I am glad you had a good time and liked all the Christmas treats. There is indeed a lovely park with views 5 minutes up the hill where dogs are welcome, however I would just like to reassure future guests, especially those with dogs that there is a small side courtyard garden with peeble stones and false grass that dogs can use, indeed our labradoodle uses this in the morning. We had such a lovely time at Moira's place. A beautiful, clean home from home in a perfect location for exploring the area. The place has everything you need with the bonus of attention to detail and stunning decor. We especially loved that our dog was welcome and we could have our morning coffee on the scenic balcony. Communication prior to and during our stay was faultless. We highly recommend coming here and can't wait for our next visit! Swanage beach is a less than a 10 min stroll away, and is ideal for families, with many facilities and water sports. It also has a scuba diving centre near the pier. Sandbanks beach with its beautiful sand dunes and surrounding countryside is a 15 minute drive away or can be reached by bus from Swanage. Poole harbour is famous for wind and kite surfing, and is accessed over the chain ferry from Sandbanks. Bournemouth has its new surfing beach and Lulworth and Durdle Door are a 30 min drive away. Swanage town has many shops, restaurants, cafes and pubs, alongside two supermarkets. It makes an excellent base to explore this area of outstanding natural beauty, and to take part in water sports and activities. Booking Notes: prices are as quoted in price table. Price is for booking the whole maisonette, sorry no discount for under-occupancy. Guest details form will be emailed to you after booking is confirmed. We love our pets so accept up to a max of 3 dogs unless miniature. There will be a charge of £40 for up to 2 dogs per STAY and £20 per STAY for 3rd dog. Other pets will be considered on request and a charge discussed. When you request to book, if you have more than two dogs, please let me know so I can adjust the price. Changeover Day: Changeover day is Friday for weekly bookings in high and peak season. Departure by 10 am, arrival after 4 pm Please note there is a minimum stay of 7 days in peak and high season and a minimum of 2-4 day outside of season (Please see price table for dates).